Which Time Management Tools Are Right For You? Format – D you plan by the minute, the hour, the week or the month? Size – Will you use your planner at your desk or travel with it? Scheduling needs – Do you keep track of yourself or multiple people? Personal style – Want to reflect your favorite causes? Want something professional or something with flair? Show a day, week, or month at a time to help keep busy schedules in order. Geared toward offices with multiple schedules to track, such as medical and law practices. Often include notepads, storage and telephone/address scetions. Keep the day or month in sight, plus they offer space to jot down reminders or appointments and many feature soothing photography and inspirational quotes. Show a month or more so multiple people can easily coordinate. Best for: Long-term planning and big-picture thinkers. Are great for managers who track employee work and vacation schedules or project timelines and for educators who track student jobs and assignments. Best for: Keeping track of project deadlines, production schedules, vacation or weekly schedules. Are formatted for a 13 or 14 month academic year and many double as assignment books. Wire binding – allows your appointment book to lie flat. Tabbed sections – easy access to the month or section you need. 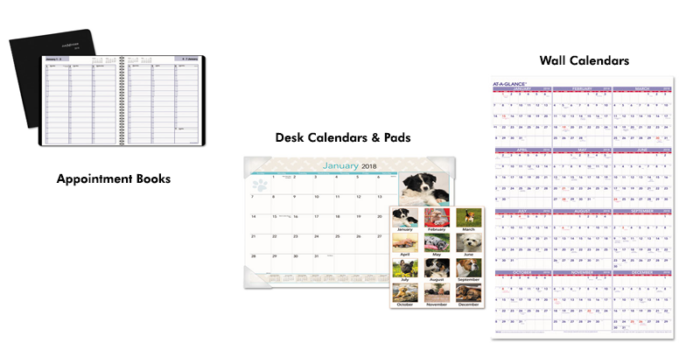 Reference calendars – see the month or quarter with one glance. Four-color photography – soothing visuals brighten your space and your day. Telephone/address section – keeps important contact information handy. Note-taking space – perfect for quick reminders and info. Fashionable colors/designs – get a calendar or planner that reflects your style.